Organic Pizza Sauce. Use your favorite or this recipe, with only 15 ounces sauce instead of 30. Toast your tortilla directly on the rack so it becomes firm for a few minutes before adding your toppings. After it is firms and hot, add your sauce, veggies, and cheese(s), and season to taste and return to oven for a few minutes for cheese to melt. 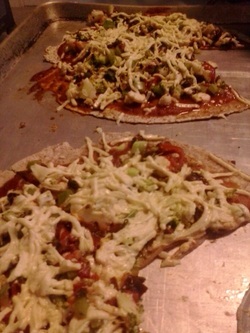 Not very doughy, but a great substitute for yeasty pizza, loaded with veggies - that are pretty raw though warm!